The above is the Glen’s Christmas card this year and they will have been dropping through more than a few letter boxes over the past day or two in the run up to Christmas. It features all three teams-the Premier side, the North Div 2 and, of course, the Under 17s with the London Shield. 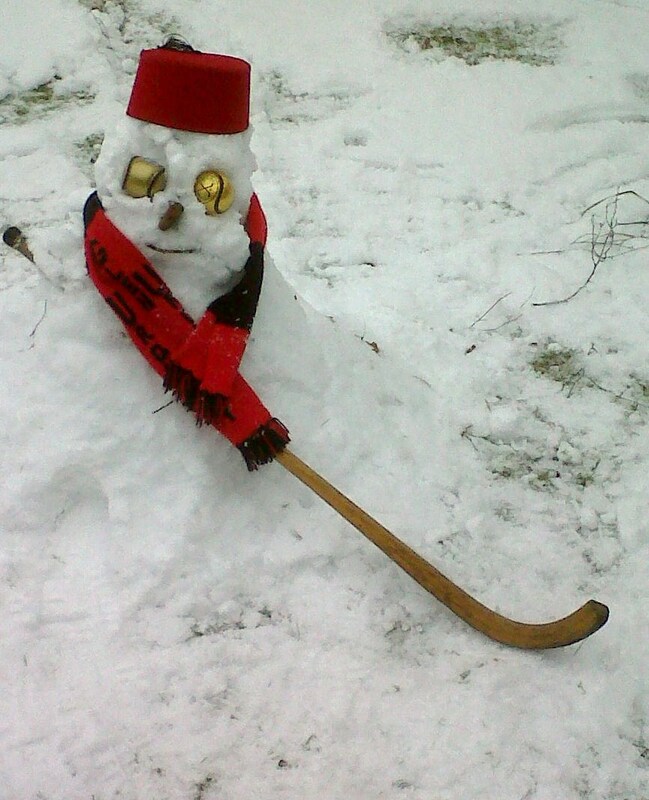 Also sending out Christmas greetings from whiteout Shintyland is the Glen’s Snow-bodach who was trying to get a wee knock on the front green before Santa came - nice to see he’s reassuringly retro with his “Currachd Ruadh” and his old McPherson hickory one –piece. 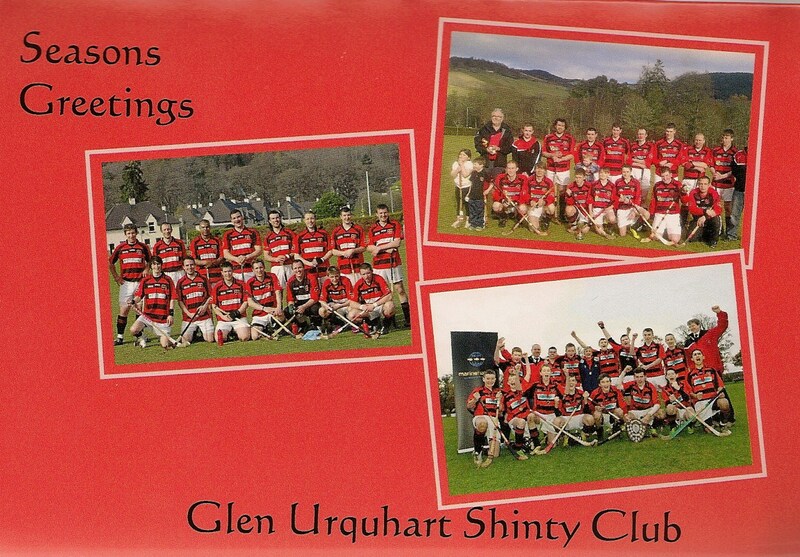 Without even Zandra’s Sixes to keep us on our toes, at this time of the year there not much doing shinty-wise in the Glen except to turn on Caman on Alba every Thursday at 8.30pm. to see what EJ has been up to the previous week. He’s had quite a time so far, but for the Wing Centre the highlight has been when he got that Chinese bird to put him on fire. As if merely sticking pins in EJ wasn’t enough, the lady in question attempted to cause him to burn down and Ed in his pants too! No doubt there will be some further ups and downs to come but the betting in Balmacaan is that he’ll be back fit to play for the first team before the end of the series. To strike a more sensible note for a moment, the programme is turning out to be not half bad with one particularly powerful, genuine piece of television when David Macpherson (senior) spoke movingly about when young Davie told him about his cancer. One might have thought that such a moment was worth a mention on one or other of the TV reviews that are churned out in the broadsheets and tabloids- but no such luck. Such was ever the way with things shintywise. Though we are making strides, Shinty is still ignored by the big wide world. Ever since Greek traders came in contact with nomads on the Russian steppe north of the Black Sea in 800 BC, the notions of “civilised” and “barbaric” have come to poison European thought. The prejudice was picked up by the Romans, fed into European kingdoms and besides providing notions of Empire and racial superiority fuelled the anti–Highland prejudice of the Lowland kings leading to the Statutes of Iona and eventually the proscription of a culture post Culloden with consequent Clearances. 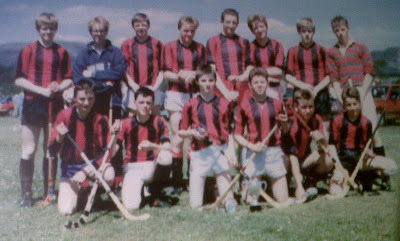 Shinty? Mere collateral damage and it still suffers today and still after all this time, if one is not vigilant, it is liable to be patronised at every turn. Wow! What was that about? Where did that come from? Doesn’t the Wing Centre care that Prof Tom Devine might pick holes in the analysis –always assuming he can find any? Nuh! . For one thing it’s always nice to see the reasons for Shinty shabby treatment in a wider context and there ain’t no wider context than the one provided above. As well as that, a further cause of the rant was the Wing Centre’s realisation that, despite Aberdeen University Shinty Club having Eck Salmond as President, his appointment won’t make any difference to the sport. Perhaps it’s better having him on board than having him not involved at all but the Wing Centre has studied carefully pictures of Eck and he does not have the look of a particularly sporting guy, and therefore he will not be especially interested in any sport let alone this quaint Hieland one. If only a football-obsessive politico like Henry MacLeish had been born in Tighnabruaich. But then again the Wing Centre might be wrong because he has been known to be wrong in the past. Once or twice. Finally the news has broken that the greatest shinty player who ever pulled on a red and black jersey has decided to retire. Yes it’s true! Big James Clark who helped Fort William to 5 Camanachd Cup wins (2005, 2007 2008 2009 & 2010) has decided to hang up his golden caman at the age of 37. Big Jim has let it be known that being a partner in a joinery business has meant that his work commitments mean that he has found it difficult to attend training sessions. His loss is huge for the sport because though as far as the Wing Centre is concerned he did not really receive the media attention his special skills deserved. On the field he was a massively powerful figure with the surest of touches with the caman, an excellent shinty brain and a deadly shot in front of goal. At his peak his skill and physique made him simply unplayable. After a season and a half with Glengarry, his home side, Jim joined Fort William in 1993, earned caps at under 21 and full international level before in 2005, winning the first of his Camanachd Cup winners medals at An Aird in the 3-2victory over Kilmallie. Jim was the man who made the difference that day when he scored two goals the second of which was the late goal which landed the Cup. He scored two more including the winner as Fort beat Inveraray 2-1 in the 100th Camanachd Cup final at Inverness in 2007 then two more as Fort beat Kingussie 2-1 at An Aird in 2008. For the Wing centre however big Jim’s most spectacular assist was in Oban in 2009 when Fort beat Kyles 4-3 in a Camanachd final in which the big man started as sub. Clark came off the bench and fired home a double including once more a last gasp winner that gave Fort 3 Camanachd Cups in a row. The big man picked up yet another winner’s medal in 2010 when Fort William beat Kingussie 3-2 at the Bught though this time unusually he did not find the net. One other little statistic that is worth mentioning is that while there have been a few players who have won the Albert Smith medal, given to the outstanding player in the Camanachd Final on more than one occasion, so far no one except big Jim has done it back to back as he did in 2007 and 2008. The thing about Big Jim is that having worn the black and red as a schoolboy in Kilchumein,he could have easily chosen Glenurquhart . He must be kicking himself when he thinks about all the Macdonald Cups and Strathdearns he could have won if only he had picked his team carefully and correctly. Indeed look at the pic here. OK so it’s not top quality but here is big Jim in a Glen strip way back in the mists of time. Indeed it is so old that it looks as if the chemicals in the print are disintegrating. Yet despite this Jim went to the Fort. Was it something we said, Jim? Never mind you are always welcome to come back. You’ll be in good company because most of our Strathdearn guys find it hard to make training too. The Cups and Downs of Shinty. We live in interesting TV Times.